In the Year Zero of the fledgling megalorepublic of Europa, an ambivalent image-maker, world-renowned, resenting the idolatry of images and his own complicity in their propagation, has gone missing, lost on a quixotic quest to give birth to cinema again, blaming the eye itself for seeing images and after-images in the infinity of the cranial cavity. What happens to his sound-man, Phillip Winter (Rüdiger Vogler) is likely to happen to us if we continue to watch. We may fall in love, either with the city or the girl, lose track of time, or grow resentful. Back in 1994, Wim Wenders sent us this postcard from Lisboa. In a strange mirroring, by the same means as Phillip Winter, we have been lured to Lisbon to solve a mystery: Where is Wim Wenders? Like the missing director Friedrich Monroe (Patrick Bauchau), Wenders is not dead, just hiding in plain sight. Lisbon Story itself is at first hard to make out, not a rock star in sight, all scribbles and Zooropa collage, a bit of chamber of commerz, haunted by a little F. W. Murnau flicker, a few dry jokes, kind of like a Schwitters painting. Halfway between a jeu d’esprit and a film-essay. A trifle, one would suppose. 1. Ten or so years before, in 1982, Wenders made a movie called The State of Things. A roman à clef, it had something to do with the sado-masochistic experience Wenders endured at the hands of an American film genius, that for legal reasons, we shall name ‘Papa Zoetrope.’ That film starred the estimable Patrick Bauchau as a director by the name of Friedrich Monroe. Sadly Wenders kills off Monroe at the end of the picture, crushing, it is believed, any hope for a sequel. 2. Out the depths of this despair, Wenders goes on to create his masterpieces of place Paris, Texas (1984), and Wings of Desire (1987). The latter film tenaciously embeds itself in the dream psyche of Europe and momentarily displaces the Eurovision Song Contest as the leading cultural artifact of the age. The film is crudely remade in 1998 as City of Angels, starring Nick Cage and Meg Ryan, sparking mass protests, a trial in absentia of the director, Brad Silberling, and a sharply worded letter from the French Ministry of Ostentation. 3. Sometime before, in the film Alice in the Cities (1974), the equally heroic Rüdiger Vogler incarnates a holy innocent by the name of Phillip Winter, who keeps turning up, as if by fictional volition, in the films of Wim Wenders. Winter, who keeps changing occupations, is like a Knut Hamsun character wrung from the page, alternately brittly unpredictable and charming. By a crude meta-fictional trope, these two are destined to meet in Lisbon. In Lisbon Story, a barber asks Winter if he is American, and with the dryness that informs much of the film, the soundman replies: “No, European.” That is to say, a brand in search of a concept. Or a citizen of Nowheresville. It is tempting to see Winter’s broken-down car breezing through the new borderless generic Novotel Europe, and breaking down just outside that most old-world city, Lisbon, as a metaphor. If this is Professor Wenders, master of the urban space, speaking, then we should listen. Wenders has always had two muses, the gossamer filmic one (image), and the solid architectonic one (reality) which commands him to love and build upon solid ground, to hear the hammers ring. The key to the tale of the city of Lisbon is thousands of miles away, in Tokyo. In Tokyo Ga (1985), Wenders goes in search of Ozu and finds Werner Herzog instead. Up above the kinetic urban madness in the relative sanctuary of the Tokyo Tower, Herzog spits his contempt for the urban spaces that Wenders loves. Herzog lays out the problem: No true images can be found. One must be relentless in the “search through this violated landscape to find images… To find images that match those inside us. ” At the time, Wenders does not show his own response. But clearly he believes the diminishing power of images to be a central problem for a moral filmmaker. The End of Violence (1996) approaches the same issue tangentially through the growing bloodthirst of the audience, which conditions the filmmaker, like some Roman impresario, to add more blood to his circuses. Clearly Wenders respects and admires Herzog’s uncompromising stance, but he cannot do without cities. In Lisbon Story, the director Friedrich Monroe, in full blown artistic crisis, gives voice to almost identical sentiments. He has gone so far as to give out video cameras to street urchins, and it is his mad ambition to take the eye out of filming. Monroe wants video images recorded without intention. Life as it “is.” It is a formalist solution not unlike that of Ozu, who set the camera at eye level, and only raised it for close-ups to eliminate the image’s distortion. But this has given Monroe nowhere to be, he sits in an old junked vehicle up on blocks, in an urban wasteland. By rejecting the pleasures inherent in the image, he also, Wenders seems to be saying, is rejecting the pleasures of place. And this is intolerable. As Phillip Winter wanders about Lisbon, filling in the missing sounds for Monroe’s film, what seems aimless acquires certainty. One cannot start again, and deny that images are haunted by earlier images in our media-wracked memory. Wenders argues for the indivisibility of sound and image. The art of Foley work, the artificial production of sounds for film, is now just a game to amuse children. It is possible (though harder) to fool the ear as well as the eye. Film’s reality has lived and died on that possibility. But we lovers of cinema must not be cynical in our desire to be fooled. The symphonic possibilities of image/sound have barely been recognized. The road ahead is difficult and fraught with danger. That is why Phillip Winter has turned up once again. Perhaps we needed to be reminded. Lisbon Story is finally also a small, loving homage to the influence of Federico Fellini on Wenders. Bauchau even seems to capture something of Fellini’s nature in his second go at Friedrich Monroe, whom the kids all call Federico. So whom do we root for in the vast dialectic of cinema? Federico or Friedrich? Murnau or Monroe? Herzog or Ozu? 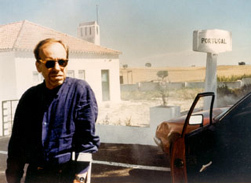 Wenders interrogates the history of cinema itself in the person of Manuel de Oliveira, the legendary Portuguese director whose career has nearly spanned the century of cinema, but leaves the question open. Werner Herzog, with his aphoristic gift, put it like this: “We had no fathers, only grandfathers.” (2) The war-baby generation (Schlöndorf, Wolf, von Trotta, Fassbinder, etc) were fighting and re-fighting Oedipal struggles with fascist parentage. To kill the Father, Herzog looked to Lotte Eisner and Murnau, Fassbinder to Sirk. Au contraire, Wenders was in love with America and Japan, and the patricidal drive has never been as strong in him. (With the problematic exception of Lightning over Water (1980), which documents/hastens the death of Nicholas Ray, Wenders’ friend and idol.) But one can kill yakuza-style, with respect, I suppose. Wim Wenders is almost 60. It’s hard to think of another major filmmaker who has devoted so much of himself to the memory of others. Good karma. He’s at the age when he should be receiving festschriften instead of making them. So, Happy Birthday, Wim. From a radio interview with Wenders and U2, “Wim and Music,” available on Wenders’ official web-site, http://www.wim-wenders.com/music/wim_and_music.htm. Herzog quote in Lyall Bush, “The Enigma of Werner Herzog,” MovieMaker, 16 (http://www.moviemaker.com/issues/16/16_herzog.html).